Reverse is a shield design. Obverse is Queen Elizabeth II. Originally boxed Royal Mint packaging, numbered with Certificate of Authenticity (COA). Mintage: 61,347 (may include coins issued as part of a set). Minted at The Royal Mint. 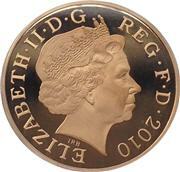 In 2002 Elizabeth II was in her 50th year as Queen making it a Golden Jubilee year. Queen Elizabeth The Queen Mother, died aged 101. Tony Blair was UK Prime Minister. The US President was George W Bush. The Commonwealth games are held in Manchester. Brazil beats Germany 2-0 to win the World Cup. The 2002 Gold Half-Sovereign Proof is an example of the Gold Half-Sovereign and is a gold coin, being as it suggests, half the value and half of the gold weight of a gold sovereign. Today, the half-sovereign is a commemorative coin, not issued every year and often only collected as part of a set. The Half-Sovereign wa introduced a long time ago, in 1544 during the reign of Henry VII. However it was discontinued in 1604 (along with full sovereigns) and not more was minted until 1817. 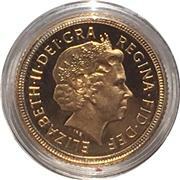 Production ended again in 1926 (1933 in Australia) and except for a few special issues during the Coronation years, it was 1980 when we saw half-sovereigns again. As the value is half of one sovereign, that give the half-sovereign a face value of half a pound or ten shillings - 50p in post-decimal money, although you're going to have to pay somewhat over the gold price if you want to buy one. The Obverse is the Monarch's head (Elizabeth II) and the Reverse is most often St George and the Dragon (usually the Benedetto Pistrucci version), although other backs have been used. These specifications apply to half-sovereigns from 1817. Up until 1604 there was a coin called the English gold sovereign and in 1816 when there was the "Great Recoinage" the name was revived. At that time standard gold (22 carat) was valued at £46 14s 6d per troy pound; this meant a £1 coin needed to weigh 123.2744783 grains or 7.988030269 g. The weight is still the same today. As a historical note: to maintain the Gold Standard, in 1816 the value of silver was set at 66 shillings for one troy pound and silver coins were only legal for denominations up to £2. The diameter of a half-sovereign is 19.3mm and is only slightly smaller than a full sovereign (22.05mm) so first appearance may confuse inexperienced buyers. You can see in the image on the right the half-sovereign on the right is quite similar to the full sovereign on the left. While you can buy half-sovereigns, many collectors only own them as part of a set. 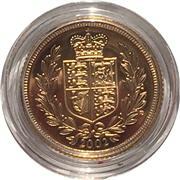 Do you want to buy or sell a 2002 Gold Half-Sovereign Proof? Selling to M J Hughes Coins means that you do not have to pay sellers fees, Paypal fees or any other transaction fees. They will give you an immediate offer and pay you the same day. Single coins or entire collection. Buying from M J Hughes Coins gives you a money-back guarantee of authenticity. Visit http://mjhughescoins.com.